The proposal is that the number of district councillors is reduced from 45 (currently) to 32. 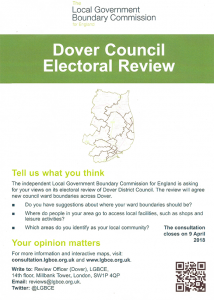 This will involve changes to the ward boundaries. It is intended that each councillor will represent approximately 3,000 members of the electorate. If River were to continue to be represented by two councillors then the ward will have to increase in size. 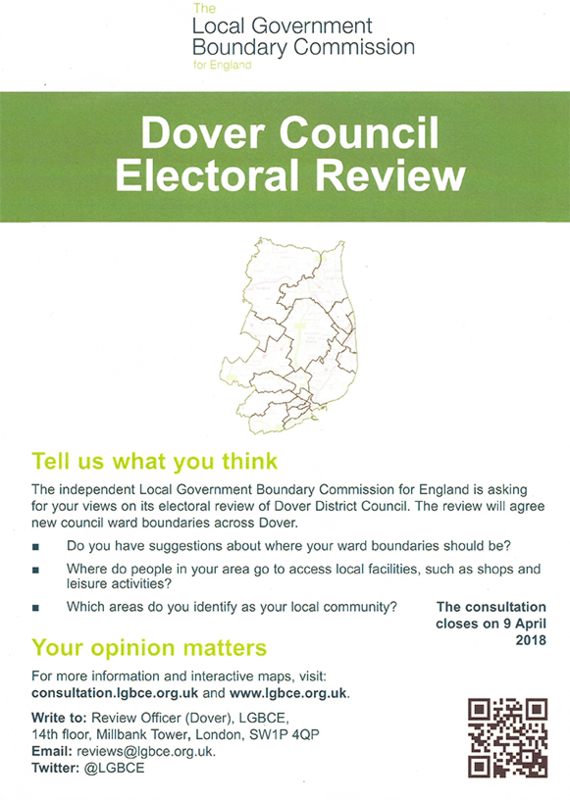 Dover District Council and the Boundary Commission will each put forward proposals and there will be two opportunities for members of the public) to express opinions. The first consultation is currently open until 9th April 2018. There will be a second public consultation when the final plan is put forward in June. More details are available on the Local Government Boundary Commission website. A meeting of the DDC Electoral Matters Committee will take place on Thursday 1st March at 4.30pm at the Council Offices in Whitfield. Members of the public are entitled to attend. Full details are available here on the District Council website. The proposal for River is that a new ward called ‘Capel and River’ will be formed to be represented by two District Councillors. A plan can be seen on the meeting paperwork.